Lungs are the major organ of our respiratory system. They help you obtain oxygen and get rid of carbon dioxide. The gaseous exchange takes place in the tiny air sacs which have just one-cell thick walls. Blood absorbs oxygen and delivers it to every individual cell in the body. Where Are Your Lungs Located in the Human Body? The lungs location is quite easy to understand. Our chest cavity houses a pair of pulmonary organs which open to the external environment through the nose and mouth. In the images, you can find them against the back muscles in the upper region of the abdomen. They are two in number. The right lung lies in the right side of the abdomen while the left lung appears to the left. A cylindrical tube, called trachea, is the main link between the human lungs and the nose and mouth. 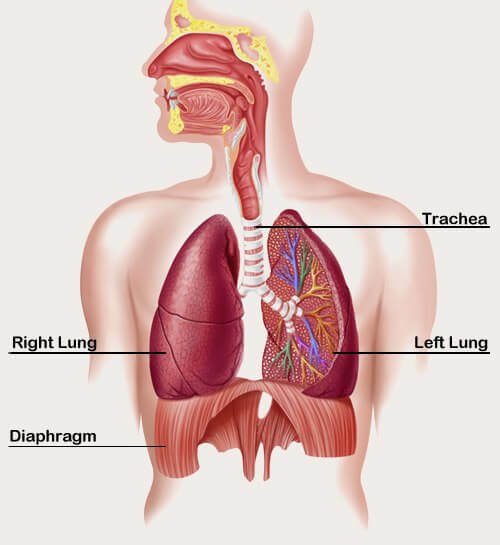 When we breathe in, air travels through the trachea to the main respiratory organs. As the trachea moves down the chest, it splits into two branches, i.e. bronchi, one for each lung. Each bronchus then further subdivides into several smaller tubes, namely, bronchioles. Thus, each lung contains many bronchioles. They spread all over its structure in order to ensure an even distribution of oxygen. You can view the details in the lungs diagram. For oxygen to be able to reach all the parts of our body, it dissolves into the blood. The blood stream then distributes oxygen to the entire body. Therefore, there has to be a supply of blood vessels in the lungs. These blood vessels are present on minute, sac-like structures, the alveoli. The alveolar sacs are present at the end of bronchioles. There are numerous alveoli in each lung. This is to provide the maximum surface area for the exchange of oxygen as well as carbon dioxide with the blood stream. How Many Lobes Are Found in Human Lungs? The size of both the pulmonary organs in a pair is not the same. The left lung is smaller and has two lobes. On the other hand, the right lung is larger and consists of three lobes. So, you can say that there are five lobes in total. Do you know the expanse combined surface area of all the tiny alveolar sacs in the lungs? Quite unbelievably, it is equal to the area of an entire tennis court. It is possible for a person to survive with just one lung. However, he would be weaker than normal individuals who have a pair of these organs. On average, the volume of air that the respiratory system takes in every day is approximately 9,000 liters! The pulmonary structures of newly born babies breathe at a faster rate in comparison with those of adults. Your pulmonary organs play an important role in respiration system of the body. Oxygen moves in when you inhale air. The air travels from the external air passages (mouth and nose) down the trachea and finally into the alveoli through the bronchus and bronchioles. This oxygen dissolves into the layer of moisture around each alveoli and finally moves into blood capillaries. 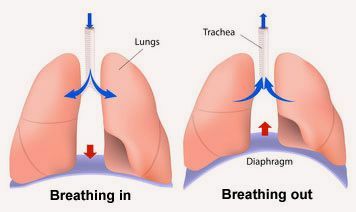 In this way, a lung plays a vital role in providing oxygen to all the body organs. It is important for your body to get rid of carbon dioxide which is a waste product of respiration. Once again, these are the pulmonary organs which help in the elimination of this toxic waste product. The path of carbon dioxide from the blood to the external environment is the reverse of the path that the oxygen takes to enter the blood stream. These are extremely delicate organs which can be damaged by several different factors. For example, air pollution, smoking and carcinogenic agents are very harmful to them. Following are some of the most common lung diseases. Bronchitis is the inflammation of bronchi. There are two types of the disease, i.e. 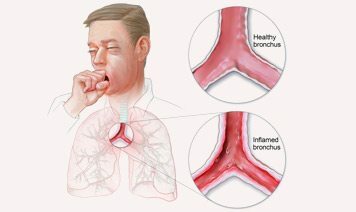 acute bronchitis and chronic bronchitis. The former often occurs due to the invasion of viruses. The common symptoms include frequent cough and the production of sputum. On the other hand, chronic bronchitis is the result of smoking. Air pollution and dust may also lead to this disease leading to prolonged cough. Shortness of breath and fatigue. Cough with yellowish-gray, green or white sputum. Slight fever and discomfort in the chest region. When the above symptoms last for three weeks, you need to see a doctor. For the treatment of this pulmonary disease, the doctors initially recommend the use of steam or humidifier. It will ease breathing. Further, they may prescribe a cough syrup and other medications for opening airways and reducing inflammation. Here the antibiotics will not be useful because they are not effective against viruses. 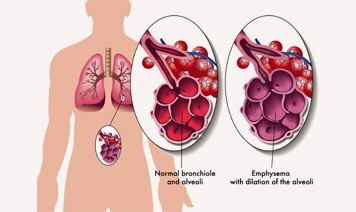 Emphysema is a common lung disease which may develop when the pulmonary organs lose their elasticity during old age. Damage to different structures, like alveoli, may also lead to this disease. Therefore, the respiratory system in unable to perform the function of the exchange of gases properly. Consequently, air gets trapped in the lungs leading to extreme difficulty in breathing. Shortness of breath and difficulty in breathing while doing exercise. Pain and feeling of tightness in the chest region. The only available cure for the emphysema lung transplantation. However, the healthcare providers prescribe certain medicines. These are to make the symptoms less severe. Such drugs are also effective in preventing further damage to the organs. Lung cancer is a disease becoming more and more widespread all over the world. Its major cause is regular smoking. The lungs start degenerating. Therefore, they fail to perform their function properly. Lung cancer is not easily incurable. It may lead to death. Persistent coughing which gradually becomes intense. Feeling of pain in the back, shoulder or chest region. Abnormal voice changes, such as hoarseness. Production of harsh sounds while breathing. Shortness of breath and changes in the color of sputum. 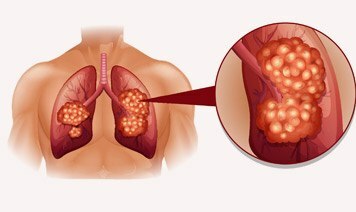 There are different types of lung cancer. Each kind requires a specific treatment methodology. For example, the small cell lung cancer can be treated with the help of chemotherapy and radiotherapy. Here surgery is not usually effective. However, non-small cell lung cancer needs different treatment. You can go for radiotherapy, chemotherapy and radiotherapy or a combination of these.